Something happened to me last week. I fell madly, madly in love—the kind of love that you can’t stop thinking about, can’t stop talking about, and seriously can’t get enough of. The object of my affection? 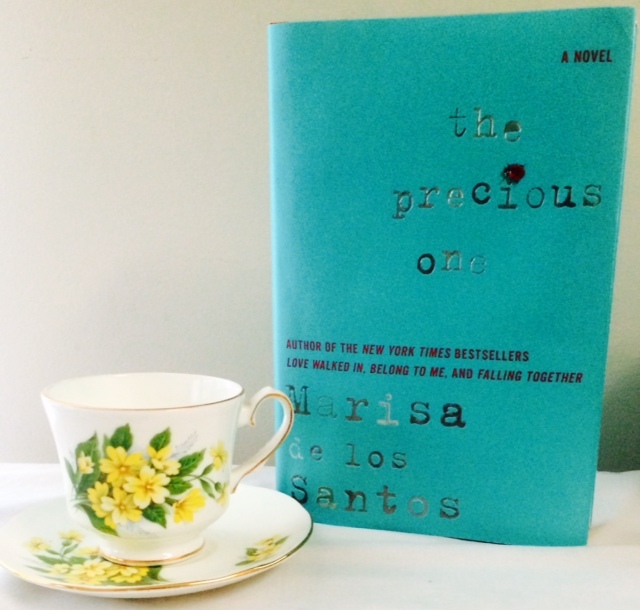 The Precious One, the new novel by bestselling author Marisa de los Santos. The Precious One tells the story of Taisy and Willow, two half-sisters with seemingly little in common aside from their brilliant, self-absorbed professor of a father, Wilson Cleary—and even on that point, they differ. To thirty-five year old Taisy, Wilson is the estranged figure who wrote his first family off when he remarried and started a new life. To sixteen year-old Willow, he is the doting, overprotective father who has molded her through years of homeschooling. After suffering a heart attack, Wilson summons Taisy to the hometown that carries so many memories of heartache and happiness, bringing her into the home he now shares with his “new and improved” family. Told through two incredibly captivating voices, the novel follows Taisy’s journey as she reconnects with her past—which includes her lost-but-never-forgotten first love, Ben—and Willow’s equally heart-wrenching submergence into high school, where she is somehow too mature and too sheltered to fit in. It is a tale of family, of love, and of coming to terms with the past, and I adored every word of it. Every sentence de los Santos writes is a bit of poetry—gorgeous, never over-written or flowery, just a little treasure that I want to read and re-read until I have to remind myself to move on. Her way with words is simply beautiful, but it never overshadows the story or feels untrue to the narrators. In fact, it adds to their complexity, making them feel all the more authentic and unique. I absolutely loved Willow and Taisy, every flawed, endearing, heartbreaking and heartwarming bit of them. The alternating chapters between the two sisters’ points of view flowed seamlessly, and never once did I find myself more invested in one story over the other. I was thrilled each time I returned to Taisy’s mind, just as I couldn’t wait to get back into Willow’s narrative. This is a testament to de los Santos’ writing, and to the characters she creates. Above all, The Precious One is a story about people, and I could not get enough of them. Each character de los Santos brings to life is complicated, captivating and entirely human. Even the unsavory ones—and there are a couple—never once dip their toes into the dangerous caricature pool. They are real and well-rounded, making their cringe-worthy actions all the more unsettling. As for the characters we can root for, there’s a whole slew of them—even some we may not have suspected—and the only drawback to them is that we have to say goodbye. I cannot recommend this beautiful book enough. I was so emotionally invested that I still find myself thinking about it throughout the day. If you’re in the market for an engrossing, touching and heartwarming read, dive right into The Precious One—and be prepared to fall in love. For more on the wonderful Marisa de los Santos, her books and her adorable dogs, check her out on Facebook and Twitter! Don’t forget to connect with Book Perfume on Facebook and Twitter, too! Thank you, Carol!!! I’m so looking forward to the Reading with Robin discussion!! !